ExpressVPN is a massive VPN with a huge selection of countries and cities to choose from. With their higher $12 price point, ExpressVPN provides exceptional speeds across all servers. They do lack in basic features while their computer client has little to no features. However, ExpressVPN supports nearly any device and provides great security. ExpressVPN is a larger company based out of British Virgin Islands who has been providing excellent VPN services since 2009, marking them six year veterans in the VPN industry. ExpressVPN is one of the larger players in the VPN market with access to loads of countries, unlimited device support and blazing fast speeds. ExpressVPN has a pretty simple pricing structure, with three different tiers offering all the same features, just longer subscription periods. ExpressVPN’s defiantly marks themselves as a more premium VPN with their most basic one month VPN subscription starting at $12.95. 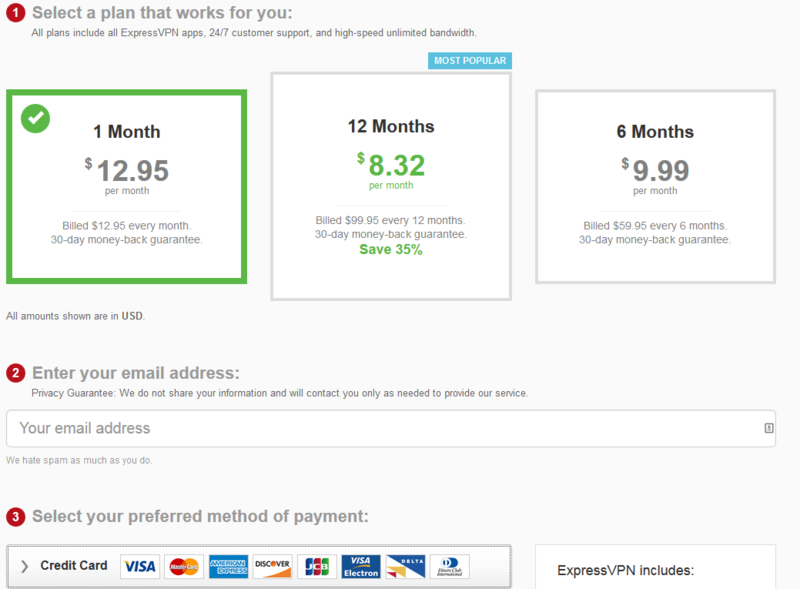 Quite high seeing as most one months VPN subscriptions cost around $6-8. Then they have a six month package at $9.99/mo which costs $59.95, even their six month package is quite high. ExpressVPN’s ends the packages with their best deal at a year for $8.32/mo which costs $99.95. ExpressVPN’s simple yet high pricing structure shows this VPN is not your standard run of the mill VPN, marking themselves in the more premium category. With ExpressVPN’s higher price point they don’t offer a whole lot of visible features, but do applaud themselves at being the all-in-one VPN. According to ExpressVPN, their VPN has the ability to hide an IP address, encrypt communications, access any site, unblock websites, avoid surveillance, protect your identity, stop hackers, not monitor nor log, protect you from third-party trackers and access to 78 countries. All should come pretty standard with a VPN, aside from the broad list of locations only ExpressVPN offers. One feature that we did find unique to ExpressVPN was their list of supported devices, including everything from Windows phones, to e-readers, a wide array of router configurations among more. Having clear and dedicated clients for Windows, Mac OS X, Android and iOS. Other devices including gaming consoles, other phones and an obscure list of operating systems which is perfect to get ExpressVPN up and running on any device. To put it simply, ExpressVPN is clearly one of the most compatible VPN’s we’ve seen in the industry, having clear and concise support for any and every system needed. Another reason they can slap the premium price tag alongside their VPN. Now lets get down to what makes a VPN a VPN, security and privacy. According to ExpressVPN’s terms of service, the company does “not collect or log traffic data or browsing activity from individual users connected to our VPN.” However, they do monitor “times when connected to our service, choice of server location, and the total amount of data transferred per day.” While this isn’t necessarily personally identifying information, we believe no log information should ever be stored on customers. They also continue to note that their software may have built-in analytic tools that transmit information on bugs to the provider. While they claim this is not personally identifying information the fact that their software has built in trackers is troubling. Meaning when you open your computer and connect using their software, both ExpressVPN and their third-party analytic provider have the data. What the third-party does with that data is out of ExpressVPN’s hands, making this worrisome. In regards to security, ExpressVPN lacks documentation on their encryption and protocols used. While scouring through the site all we found was that ExpressVPN uses 256-bit encryption. While yes this is generally strong, it depends what protocols and ciphers are being used to secure the communications. ExpressVPN is another VPN lacking complete transparency on their security practices. Speed on ExpressVPN was expectantly fast. When using OpenVPN on our Tomato router, we experienced nearly loss less speeds on servers close to our real location. When using the Windows client we didn’t experience nearly as fast speeds, we were met with maybe 2/3rds of our speed. But that isn’t to say the speeds were slow. ExpressVPN provided consistent, strong and reliable speeds. Some overseas speeds we’re far slower than expected, however a majority of servers reigned over with great speeds. ExpressVPN has some of the fastest speeds we’ve seen across a huge variety of servers. *Speedtest results coming soon due to ongoing issues with consistent ISP speed. ExpressVPN customer support will rarely be needed, but in the case you do the support staff is kind and friendly. Contacting support through ticket or email was pretty simple and the staff are knowledgeable and ready to help, unlike other companies. ExpressVPN has a large knowledgeable and extremely detailed guides for getting any device setup, making connectivity a breeze. Singing up for ExpressVPN was single handily the easiest transaction we have ever had. After choosing our plan we entered our email and proceeded to check out. From there we entered our credit card information and our account was instantly activated. After our signup was complete we were directed to a setup page. Within that page is an activation key that you use to activate all your clients and devices. Instead of using the average username and password on some devices, they use a code which automatically authenticates the account. Signup was extremely fast and simple. Following completing signup we are directed to a page where we can install clients. Now this is where ExpressVPN says they shine so lets take a look at the client and features. After first installing the client and entering your activation code you’re met with the main interface. Upon opening the client its quite minimal with little to no colors. Aside from it’s minimalist style the client withholds very few features aside from being able to pick the location and what protocol you use. ExpressVPN’s location picker is a large list of countries available to choose from in a nice and alphabetized list. The list is quite bland but can be categorized a number of ways for optimal usage. As you can see, nothing really to special. 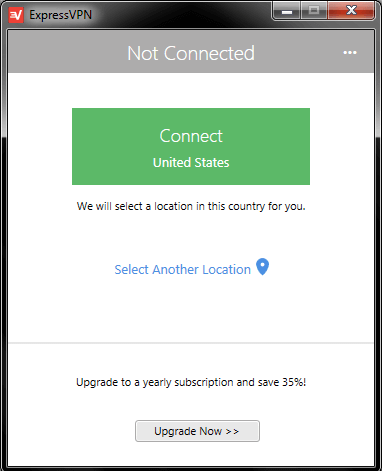 Now aside from being able to choose your location they also have the ability for you to change what protocol you use on the VPN. 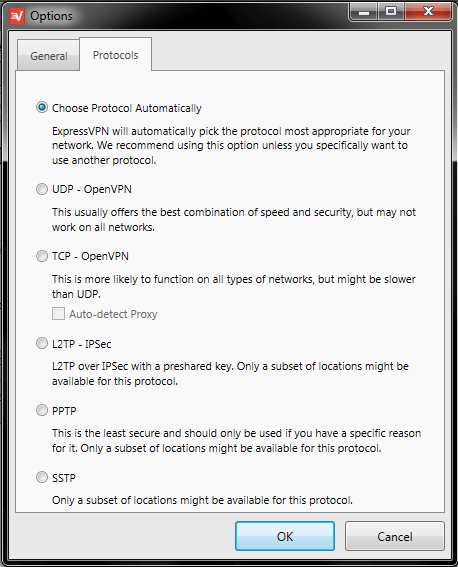 The obvious protocol you want to use being OpenVPN, however, the VPN does support a barrage of protocols including UDP and TCP OpenVPN, L2TP – IPSec, PPTP and SSTP. This feature is quite nice as they support a number of protocols to use if the network is blocking a certain type. While yes this is a useful feature it doesn’t add a whole lot to the client in terms of usability. For ExpressVPN’s higher price point we were extremely disappointing with their bland and feature lacking Windows client. For supported devices, all of ExpressVPN’s clients are exceptionally bland and just a condensed desktop version. What’s nice is the mobile app has all of the countries listed and it still allows you to choose different protocols, something many providers seem to leave out on their mobile clients. Aside from that, ExpressVPN has the largest list of supported devices, so a lack in their main client may not be big deal for you. However, if you are looking for a client packed with security features and extras, this VPN is not for you. Not to say they don’t provide encryption and security, just many other clients in the industry today offer DNS leak protection and VPN killswitches, which ensures no packet leakage. What is a security test? A security test is something we at VPNFTW exclusively do to see just how secure a VPN is right out of the box. This test consists of us installing the Windows client fresh out of the box and seeing if the VPN really protects us with no additional settings changed. This will also ensure the VPN is protecting our whole system by requesting Java and Flash applications to load from the computer. This will truly test if the VPN is masking everything. This will allow us to ensure our IP is not being leaked along with out DNS queries, which could be critical. To perform your own security test read out how to check if your vpn is secure guide. Now onto the test, we will be performing an extended IP test along with a DNS leak test. 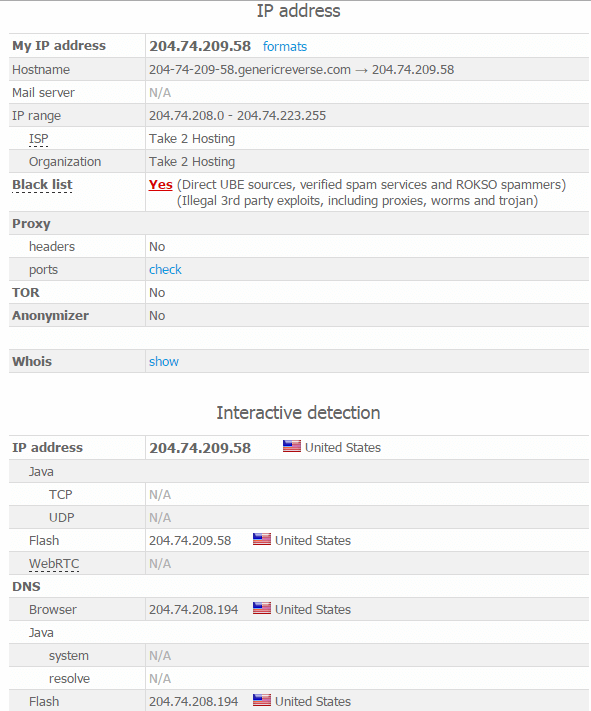 With a fresh install and connecting to a San Francisco server right out of the box it appears ExpressVPN is masking our IP address and no critical leaks have occurred. While performing a DNS leak scan we were happily met with the same results. Out of the box ExpressVPN did protect all of our connections. While testing various other protocols on different servers we were gladly met with the same results, zero leakge. Overall ExpressVPN was an exceptional VPN. Though it does lack in features and complete transparency the VPN is stable, feels secure and has amazing speeds across a majority of its servers. Though if you’re looking for a VPN jam packed with features, ExpressVPN may not be your first choice. 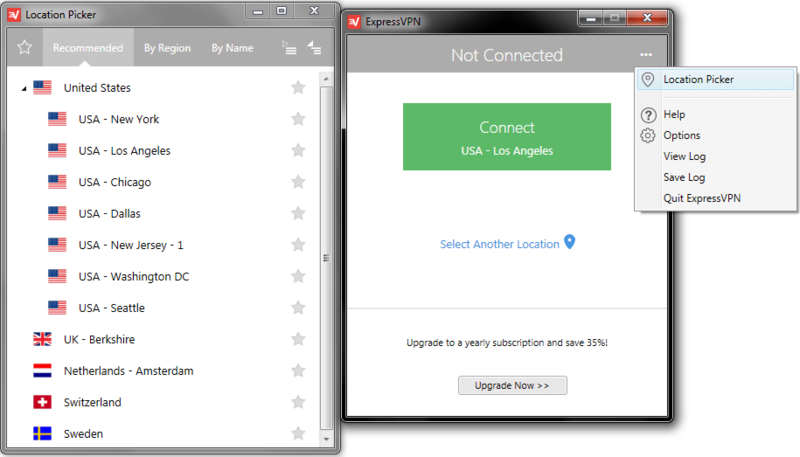 Also ExpressVPN is on the pricier side, making this VPN have a much more premium feel without all the perks. ExpressVPN may not be for everyone but if your looking for a wide array of locations and unlimited device support, ExpressVPN is for you.